If you are a classroom teacher I understand how teaching music can be very daunting but I can tell you that I was in your shoes 10 years ago. Without having any university training in teaching music I just happened to be the closest there could be to a Classroom Music Teacher in my rural school because I had learnt Piano, Clarinet & Saxophone in High School. To make things easy on myself I went about finding a developmental curriculum that was easy to use and understand with minimal background in music teaching. 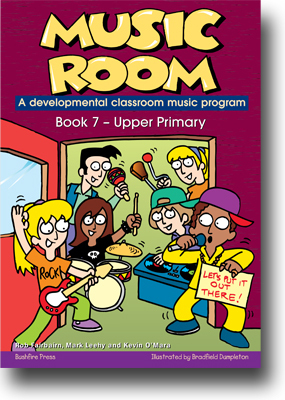 I stumbled across a fantastic Australian resource ‘Music Room: A developmental classroom music program‘ by Bushfire Press. At the time they had only published level 1 & 2, now seven years later we have 7 levels in the series and Book 7 was awarded ‘The Best Primary Teaching Resource’ at the Australian Educational Publishing Awards 2012. This program has been a saviour for many classroom teachers & starting our specialist music teachers to help us teach music across the Primary Years. Many experienced Music Educators also use it compliment their program and as a relief teacher resource. I know from personal experience my relief teachers always comment how easy the resource is to use and that it puts them at ease because of the simple layout & instructions. Out of this question to Bushfire Press birthed my 3 publications ‘The Interactive Music Room: A classroom music program for the interactive whiteboard‘ Levels 1, 2 & 3 (Level 4 will be out early 2014 and 5-7 to follow). My aim with these publications, apart from the 2 reasons above, was to make the resource even more easy for classroom teachers to use and to capture those hard to engage students. 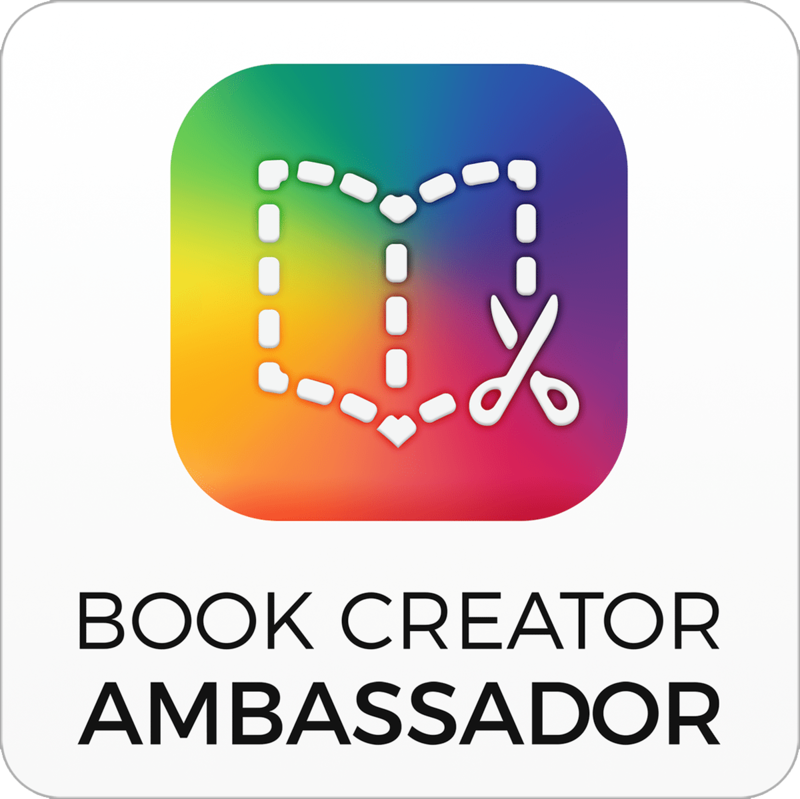 The comment from my Principal at the time when he saw my published work was “Cheryl I think you have actually put yourself out of a job, this resource is so easy to use”. Have I achieved engaging those challenging students? YES! I recently have taken parenting leave to allow me time to focus on my children while keeping up with a publishing schedule. I have been shocked by the number of students who have approached me asking when I am coming back because they miss my music lessons and what breaks my heart is when I tell them not until the end of 2014 their faces drop. However the best part in these situations is that over 50% of these students have been the ones we struggle to engage with in the classroom – and these are the moments we live for as a teacher. I’d like to encourage you to check out my resource and the rest of the great curriculum resources we have for Music and The Arts at www.bushfirepress.com. With no prior experience with teaching in an IB PYP school, starting out last year in my new school as the Classroom Music Teacher was quite a daunting experience. I was truly blessed though to have great support in my Principal and other staff members who encouraged me to teach my music program from my previous school and try and link in to the class UOI’s where I could. As I do in any situation I set about trying to impress as much as I could and link as often as I could to the classroom UOI which I thought would be the best PYP inquiry teaching. What I found though was the skills/techniques I wanted to teach the children were not being done chronologically/developmentally as I tried to focus too much on the OUI taught in the classroom. 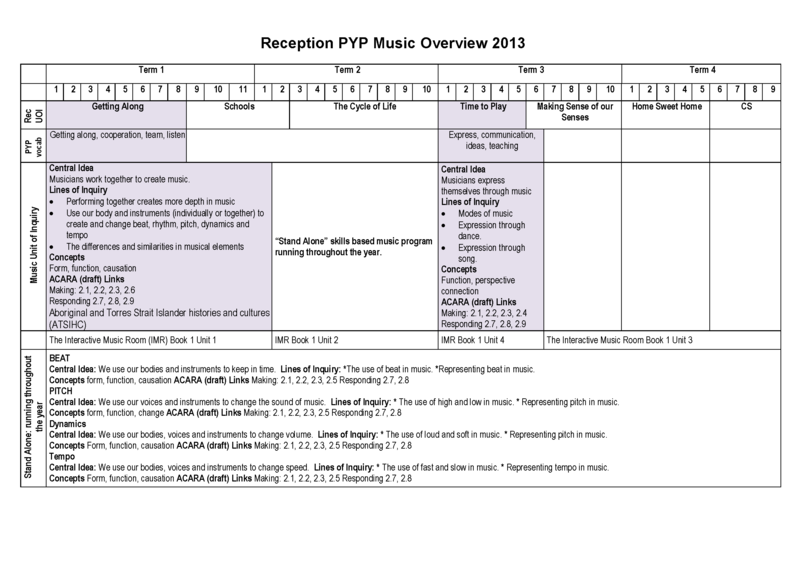 I was a little frustrated with this and didn’t understand how I could honour my discipline of teaching musicianship and authentically link to the PYP units being taught. At the beginning of this year I went to the 3 day course “Making the PYP Happen in the Classroom”. This was my first experience of IB PYP Professional Development and yes at the start I was completely overwhelmed by the whole thing. How can I teach classroom music in an IB school, using the inquiry methodologies to AUTHENTICALLY link to the class UOI and at the same time HONOUR my developmental curriculum. At this workshop I realised I was focusing too much on the ‘UOI’ and not on the skill development of the children because I mistook linking with the classroom to be more important than the skill set I was teaching. I was focusing on the topic/theme/idea eg using an indigenous song and then singing, dancing or playing instruments to it, rather than focusing on the skills & techniques and using my language during my lesson to link into the “concepts” being taught. This may be a wonderful concept & idea but Theo said it is very hard to pull off, especially if you are only part time. This is where the Specialist subject teacher/s plan the UOI and the classroom teacher links in with it. Specialist teachers don’t need to link with every UOI, as long as you find at least one UOI to link with in the year that is suffice. To find this UOI look for authentic and purposeful links to the work in both classrooms, which allows you to honour the discipline that you are teaching. You can write your own UOI that links with it or even take a line of inquiry from the classroom UOI. The best way to link in is with the PYP Concepts being taught. Here the key is ensuring the language (key words/ideas) used in both class settings is the same or similar. 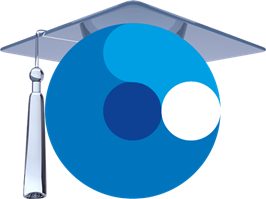 These links can be done before, during or after the class UOI is taught. For example this year I have linked with the Year 6/7 OUI on Ancient Civilisations by teaching my Ancient Celtic Music unit before the class did theirs and this worked fine. Single subject teachers don’t need to teach all 6 transdisciplinary themes because it is unrealistic & not authentic to the disciplines being taught. So while we need to teach 6 UOI over the whole year it may be more appropriate to teach from certain themes eg. “How we express ourselves”. Our Stand Alone Units may also be taught throughout the whole year with no fixed start or end date. For example you may use Musical Elements as your UOI. Beat for example can be taught all year round as you refer to it along the way. How have I now implemented this in my classroom? I have 6 UOI, 4 year long ones & 2 that link to the classroom UOI. 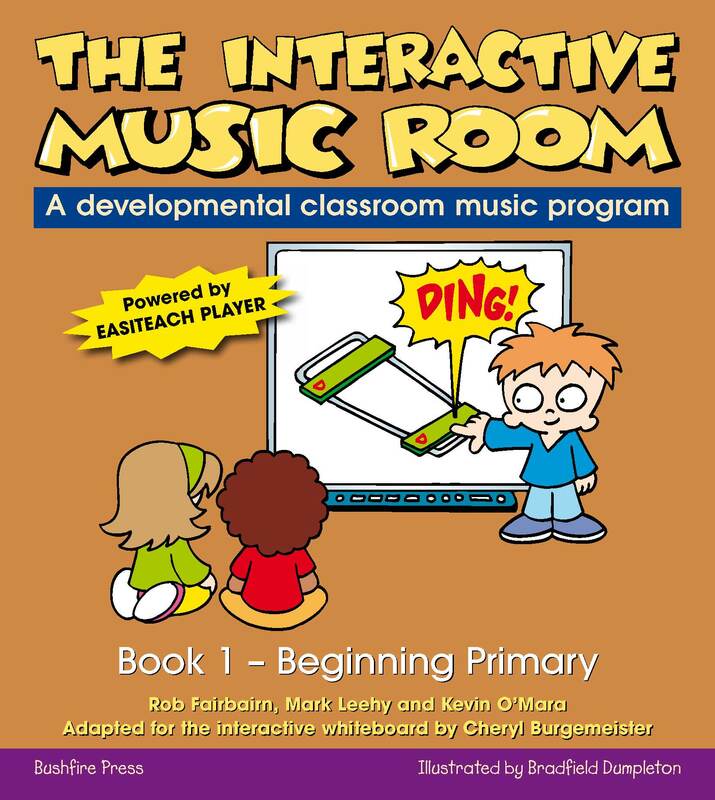 To honour my discipline, I still use my developmental curriculum ‘The Interactive Music Room: A developmental classroom music program for interactive whiteboard, Book 1- beginning primary’ which I have adapted from ‘Music Room: A developmental classroom music program, Book 1 – Beginning Primary’. However while this resource has been written with inquiry learning in mind, I always add other resources to this to enhance the UOI being taught and bring personal meaning to the students learning. In the future I will post a blog on how I present and display this in my lessons. I am and will be constantly looking at how I can better improve this. And in no way do I believe I have conquered this task of a 100% answer to my initial question, on how to authentically plan a PYP UOI as a specialist/single subject teacher. But I do believe I am now on the right path, or at least on the verge! For me I have loved (and will continue to) the chase of aspiring to plan in the most effective and authentic way in a PYP school. I am becoming a better teacher for it and can’t wait to see the results. How has it changed me as a teacher? The skills, techniques, activities, songs and instruments haven’t changed. It has been the vocabulary I use when teaching which has changed as I focus more on the way I deliver information to the children to keep the lines of inquiry at the forefront of my lessons. My questions to other PYP specialist/single subject teachers out there are: How do you plan? What has worked for you in your school? How do you link to the classroom UOI while staying true to your discipline? Read part 2 in this series showing the overview of my 2014 planning. But I don’t have an Interactive Whiteboard! have no fear… there are other ways around it! In the current school I work at I do not have an interactive whiteboard in my room. Having just invested in an iPod I came across an app called Air Display which allows you to control your computer remotely from your mobile device, trialling this by using one of the school’s iPads I then invested in an iPad myself. I now successfully run my lessons with my laptop attached to a data projector and pass my iPad around the class for the students to interact with the screen. The students love this and I feel it is just as interactive as if I had an IWB. In fact I like it better as my students remain seated and I take the iPad to them. 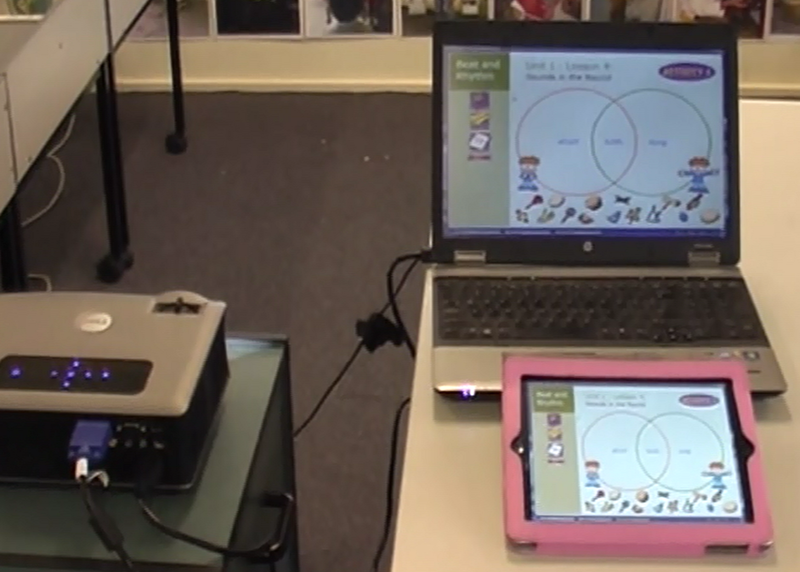 computer attached to data projector, iPad mirroring the computer through ‘Air display’. below is a handout I wrote for my Interactive Music Room presentation at MTEC in Melbourne in April. I am a primary classroom music teacher, teaching levels Reception through Year 7. I have been teaching since 2003. My first 3 years I taught in the UP classroom and since 2006 I have also been a specialist Classroom Music teacher. This is my 2nd year teaching in an International Baccalaureate School and am loving the challenge of learning how to plan IB PYP. My Aim is to better understand how to marry specialist music with classroom units of inquiry, while trying to create authentic links that not only link to classroom learning but allow me to honour the music curriculum I teach. 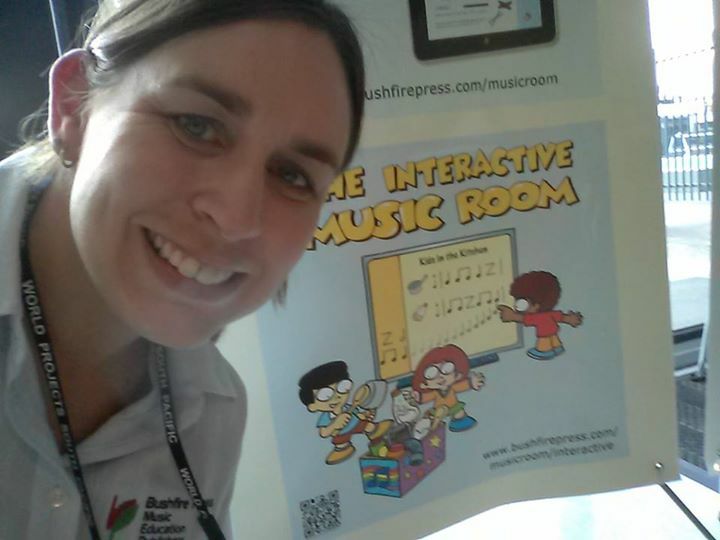 I am also the author of ‘The Interactive Music Room‘ a joint project with Bushfire Press where I adapt their ‘Music Room‘ resource for use in the Interactive classroom on IWB’s & soon mobile devices. Here I will be posting music resources, strategies, lesson ideas and activities I am using & trialling with my students. I hope you can benefit from my posts. BEd. Grad Dip Th Ed.